Practising as an artist-printmaker from my studio in Ely, I create hand-made original prints in small limited editions. 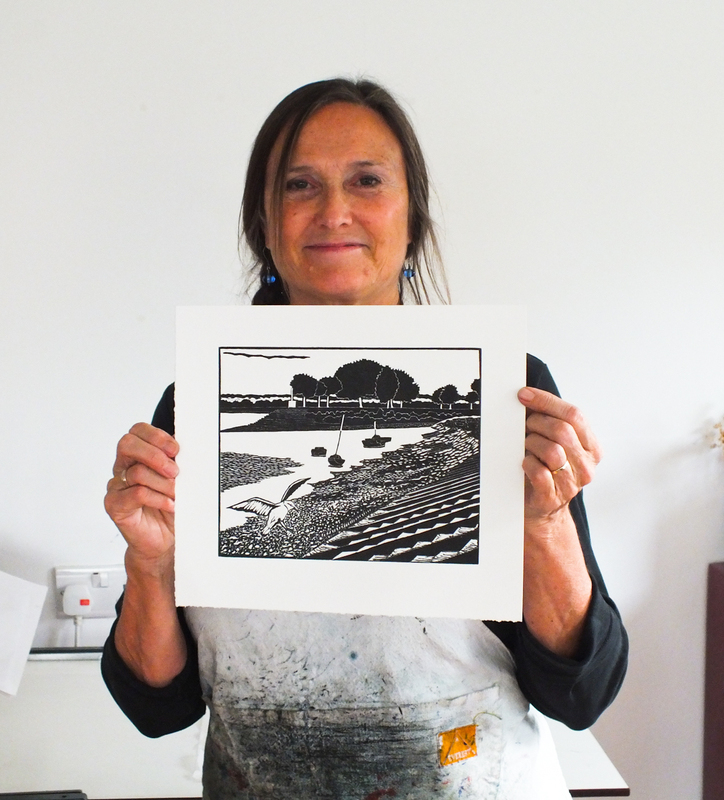 I favour woodcut; both black and white single block and colour multiple block, although I have tried most printmaking techniques over the years. I enjoy working with wood rather than any other material and I utilise the grain where possible to add variety to the markmaking, which is key when working in black and white. Using Japanese tools, I cut my designs into Japanese plywood and print onto Somerset, Fabriano or Japanese papers with oil based ink. I take black and white prints on my etching press and print colour multiple blocks by hand using a baren and a kento registration block. I have exhibited with Cambridge Open Studios since 2012 and show my work regularly in East Anglia and occasionally further afield. If you would like to purchase any of the work on this website you can contact me via the link on the front page for prices and details. All woodcuts are sold unframed and will be sent free of charge by courier (tracked and insured) to mainland UK - for other destinations please ask for a price. As a price guide, my woodcuts are £60 - £110 unframed, depending on size. Alternatively my work can be found online at Buy The Sea. 2002 - 2005 BA (Hons) Fine Art Printmaking, Cambridge School of Art. 2000 - 2002 National Diploma in Fine Art, Cambridge Regional College. Ely Art Society Summer Exhibition - The Hayward Theatre, Kings School, Ely, Cambs. Old Fire Engine House 50th Summer Exhbition - The Old Fire Engine House Gallery, Ely, Cambs. 'Printmakers Wildlife' - Birdscapes Gallery, Glandford, Norfolk. NT Wicken Fen Pop Up Gallery - NT Wicken Fen, Wicken, Cambs. Isle of Ely Arts Festival Pop Up Gallery - Jubilee Gardens, Ely, Cambs. Red Dot Mini Print Exhibition - Stow on the Wold, Woodbridge & Wingfield Barns. Foxton Art Exhibition - Foxton, Cambs. Hahnemühle Mini Print Exhibition - Aldeburgh, Norwich, Cambridge, Halesworth & Bungay. DOUBLE VISION - Reflections on the landscape - The Old Fire Engine House Gallery, Ely, Cambs. 2016 Cambridge Open Art Exhibition Top 20 - Babylon Gallery, Ely, Cambs. East Anglia Mini Print Exhibition - The Edmund Gallery, Bury St Edmunds, Suffolk. East Anglia Mini Print Exhibition - Garage Gallery, Aldeburgh, Suffolk. Leeds Craft & Design Centre, Leeds, Yorks. 'Words' - Obsidian Art, Stoke Mandeville, Bucks. 2015 'ADVENT!' - Babylon Gallery, Ely, Cambs. 'Sitting Ducks' - Prickwillow Phonebox Art Gallery - Prickwillow, Cambs. Cambridge Open Studios, Eastern Preview Exhibition - Babylon Gallery, Ely, Cambs. 2014 'ADVENT!' - Babylon Gallery, Ely, Cambs. 'Elementals' - Long Acre Studios, Bingham, Nottingham. Cambridge Original Printmakers - The Pitt Building, University of Cambridge, Trumpington Street, Cambridge. Cambridge Open Studios (Weekends 3 & 4) at the ACE Foundation - Stapleford Granary, Stapleford, Cambs. Impington Village College Annual Art Exhibition - Impington Village College, Cambs. 'Rheebridge Top 20' - Williams Art, Gwydir Street, Cambridge. 2013 'Christmas Exhibition' - Cambridge Contemporary Art, Trinity Street, Cambridge. 'Husk of Hares' - Babylon Gallery, Ely, Cambs. 'Craft & Design Showcase' - Babylon Gallery, Ely, Cambs. Cambridge Open Studios (Weekends 2, 3 & 4). 'Beside the Sea' - Cambridge Contemporary Art, Trinity Street, Cambridge. 'Woodlands' - Cambridge Contemporary Art, Trinity Street, Cambridge. 'CAMaraderie II' - Williams Art, Gwydir Street, Cambridge. 'Art on the Hill' - Friends' School, Saffron Walden, Essex. 2012 'Christmas Cornucopia' - Haddenham Gallery, Haddenham, Cambs. 'Art Unwrapped for Christmas' - Babylon Gallery, Ely, Cambs. Norwich Castle Open Art Show - Norwich Castle, Norwich. Rheebridge Open Art Exhibition - @the atrium, Cottenham 6th Form Centre, Cambridge. 'Winged' - Kings College Art Centre, Cambridge. 'NewArt @ ArtCell' - ArtCell at Cancer Research UK, Addenbrookes site, Cambridge. 'Craft and Design Showcase' - Babylon Gallery, Ely, Cambs. Group Exhibition, Curwen Print Study Centre, Chilford Hall, Linton, Cambs. 2011 Cambridge Open Studios @ Williams Art - Williams Art, Gwydir Street, Cambridge. 'Beyond Words' - Addenbrookes Hospital, Cambridge. 'Beyond Words' - Williams Art, Gwydir Street, Cambridge. 2010 'Small Wonders' - Williams Art, Gwydir Street, Cambridge. 'Christmas Crunch' - Artworks MK, Milton Keynes. General Display, Addenbrookes Hospital, Cambridge. 'Fitz favourites' - Williams Art, Gwydir Street, Cambridge. 'The Art of Printmaking' - Addenbrookes Hospital, Cambridge. 'The Art of Printmaking' - Williams Art, Gwydir Street, Cambridge. 'Behind a Painted Smile' - Williams Art, Gwydir Street, Cambridge. 'My Cambridge' - Williams Art, Gwydir Street, Cambridge. 'Printemps' - Williams Art, Gwydir Street, Cambridge. 'Art for Haiti' - Williams Art, Gwydir Street, Cambridge. 2009 'Small Wonders' - Williams Art, Gwydir Street, Cambridge. 2008 'Trialogue' - Group Exhibition, Queens' College, Cambridge. 'Small Print, Big Impression' - Gainsborough's House, Sudbury, Suffolk. 2007 Waterloo Gallery Open - Waterloo, London. 'Small Print, Big Impression' - Leicester, Northampton & Aberystwyth. 2006 'Artists in Print' - Group Exhibition, Broughton House Gallery, Cambridge. Byard Art Open Competition - Byard Art, Cambridge. 2005 Postcard Show, Surface Gallery, Nottingham. Leicester Print Workshop - Mini-Print Open Competition - City Gallery, Leicester. Degree Show, Cambridge School of Art, Cambridge. 'Innovate' - Group Exhibition, St John’s Innovation Centre, Cambridge.